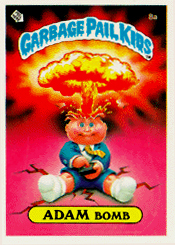 Adam Bomb (Series 1 #8a) became an icon of the Garbage Pail Kids trading card franchise; the image was used on the first five series' packs. Garbage Pail Kids is a series of sticker trading cards produced by the Topps Company, originally released in 1985 and designed to parody the Cabbage Patch Kids dolls, which were popular at the time. Each sticker card features a Garbage Pail Kid character having some comical abnormality, deformity, and/or suffering a terrible fate with a humorous word play character name such as Adam Bomb or Blasted Billy. Two versions of each card were produced, with variations featuring the same artwork but a different character name, denoted by an "a" or "b" letter after the card number. The sticker fronts are die-cut so that just the character with its nameplate and the GPK logo can be peeled from the backing. Many of the card backs feature puzzle pieces that form giant murals, while other flip-side subjects vary greatly among the various series, from humorous licenses and awards to comic strips and, in more recent releases, humorous "Facebook" profiles. 15 original series (OS) of regular trading cards were released in the United States, with various sets released in other countries. Two large-format card editions were also released, as well as a set of fold-out posters. All-New Series (ANS) sets were introduced in 2003, Flashback re-releases began in 2010 and a Brand-New Series (BNS) was announced for 2012 with Brand New Series 2, Chrome OS1, and BNS3 following in 2013. A new format was released in 2014 using the year to designate the edition, followed by the release name of Series 1, which had an Olympics-style format. In 2016, the format was changed again to themed sets that spoofed different pop culture topics. The series was the brainchild of Topps consultant and Pulitzer Prize-winning cartoonist Art Spiegelman, who came up with the product idea after the success of his earlier creations Garbage Can-dy and Wacky Packages. The concept originally began as an unreleased Wacky Packages title for a 1985 series, but the management at Topps thought it would be a good idea for a separate spin-off series. Spiegelman and fellow cartoonist Mark Newgarden worked together as the editors and art directors of the project, Len Brown was the manager and the first run of the cards was drawn exclusively by artist John Pound. They were first issued in 1985. Following the initial success of the cards, several additional artists and writers were brought in to contribute to the series, including Jay Lynch, Tom Bunk and James Warhola, among others. The cards were also known as Bukimi Kun [ぶきみくん/Mr. Creepy] in Japan, The Garbage Gang in Australia and New Zealand, La Pandilla Basura [The Garbage Gang] in Spain, Havurat Ha-Zevel [חבורת הזבל/The Garbage Gang] in Israel, Basuritas [Trashlings] in Latin America, Gang do Lixo/Loucomania [Trash Gang/Crazymania] in Brazil, Sgorbions [Snotlings] in Italy, Les Crados [The Filthies] in France and Belgium and Die total kaputten Kids [The Totally Broken Kids] in Germany. A smaller-sized card format was released in Australia and New Zealand. Each pack contained three stickers and the "peel here" arrow pointed to the top left area, since there was no die-cut scoring. Initially in New Zealand, a Series 6 of the Garbage Pail Kids was released as a market test (this version was a mix of the United States Series 6 and 7). After this success, Series 1 was released in Australia and New Zealand known as The Garbage Gang and was identical to the United States version (albeit smaller in size). The first series was released in Australia and New Zealand in 1989 with different versions: the Australian stickers were darker, had a different banner and some of the names were changed to reflect cultural differences. From Series 2 onward, the same version was released in Australia and New Zealand. Series 4 was the last release of The Garbage Gang. The commercial success of the trading cards led to the production of a live-action movie, The Garbage Pail Kids Movie, in 1987. An animated television series was also created in 1987, but its initial scheduled broadcast in the U.S. was postponed due to parental complaints. The show did make a brief appearance on U.S. television years after it was originally intended to air and was also briefly aired in Europe. The movie was released on DVD by MGM Home Entertainment on July 12, 2005 (the original VHS had been distributed by Paramount) and the animated TV series was later also released on DVD by CBS Home Entertainment on April 4, 2006 (with distribution by Paramount). A similar set of 160 trading cards, called The Sloppy Slobs, was released in Italy in 1993. During the height of the cards' popularity, Garbage Pail Kids were banned in many schools. One of the main reasons for the ban was that teachers cited them as distractions during class. Topps was sued by the makers of Cabbage Patch Kids, Coleco, for trademark infringement. As part of the out-of-court settlement, Topps agreed to modify the appearance of the Garbage Pail Kids to remove the resemblance between the characters and to change the logo design. Production of the cards themselves continued, but by 1988 sales had dwindled and a planned Series 16 was never produced. In 2003, Topps reintroduced Garbage Pail Kids with all-new artwork, dubbed the All-New Series (ANS). ANS1 was largely made up of artwork intended for release in the 1980s as Series 16, but 2004's ANS2 featured brand-new and original concepts. Unique numbers on the backs of silver- and gold-foil insert cards could be redeemed online at the official Garbage Pail Kids website where visitors could build and "gross out" their own Garbage Pail Kids; as the number of unique code numbers applied to the character increased, the more gross it became. Less than six months later, ANS3 was released. In 2005, Topps celebrated the 20th anniversary of the GPK franchise with special Sketch Card original art inserts for its ANS4 set. These were limited to one randomly inserted card per hobby-exclusive box (available only from specialty retailers) and featured original artwork by series regulars John Pound, Tom Bunk and Jay Lynch, as well as guest artists Strephon Taylor, John Czop, Don Perlin and Justin Green. Although a regular to the series with over 35 paintings, Luis Diaz was not involved in the sketch cards due to a previous financial dispute with Topps from years earlier. In 2006, ANS5 was released with 40 more new kids (each with an a/b twin), followed by ANS6 in early 2007. January 2008 saw the release of ANS7 which expanded the base set to 55 new characters and was the last set to feature new artwork until 2010's Flashback Series 1 subset of six previously unpublished kids. The ANS cards differ from the original series (OS) in a number of ways, the most obvious being the upgraded quality of the card stock with a glossy protective surface. The ANS releases also changed the card numbering format: OS cards used a continuous numbering pattern so that each new set would pick up where the last one ended (e.g. OS1 ended at #41a/b and OS2 picked up at #42a/b, while ANS reset the numbering back to #1a/b with each subsequent release). Each ANS also featured special chase cards randomly inserted in packs; for example, foil cards show characters from the original series (with modified artwork due to the lawsuit), Scratch 'n Stink cards, collectible card game cards, temporary tattoos, 3D pop-up cards, alphabet cards, activity cards, magnets, lenticular Loco Motion cards and die-cut jigsaw puzzle cards, along with special bonus cards available only at participating retailers in either "bonus boxes" or rack-packs; these bonus stickers were the first cards not to have a twin set. Topps released a 25th anniversary Flashback seton February 24, 2010, featuring reprints of characters from the original 1985–87 GPK series (eight each from OS1 to OS8) plus six previously unpublished "lost" characters and 10 Where Are They Now? cards, showing classic GPKs drawn as they would appear today. Packs contained randomly inserted chase cards, including lenticular Loco Motion cards, authentic printing plates, four levels of parallels and hand-drawn artist sketches by pop-culture artists, including Layron DeJarnette, Brent Engstrom, Dave Gross, Mark Pingitore, Joe Simko, Colin Walton, Fred Wheaton, Jeff Zapata and veteran GPK artists Tom Bunk and Jay Lynch. A second Flashback set was released on February 23, 2011, with 65 more OS reprints from Series 1 to 9 plus five more "lost" kids, 10 new Where Are They Now? cards, five 3D cards (resembling holograms but in full colour), unique artist sketches and 10 Adam Mania cards showing variants of Adam Bomb's iconic mushroom cloud, plus parallels of the base and Adam Mania sets. GPK Flashback Series 3 followed on November 2, 2011, with 65 OS reprints, four more "lost" kids, 10 new WATN? cards, five more 3D cards, 10 more Adam Mania cards, plus artist sketches and parallels. Topps and Abrams Books recently released a book that showcases the first five series. The cover depicts a pack from the very first series released back in 1985. Each card is displayed with the "a" name and the "b" name on the bottom corner of the page. It also included four new chase cards that were wrapped in cellophane and adhered to the inside back cover of the book, but were easily removable without damaging the book. In 2012, Topps announced it would reboot the Garbage Pail Kids franchise with new character and content themes more reminiscent of the original 1980s series in a set called Brand-New Series 1 (BNS1). The set was released on October 24, 2012. BNS1 features 55 new GPK characters, a reality TV subset, motion cards, mix 'n' match stickers, parallels, artist sketch cards and code cards redeemable for a chance to be painted as a GPK in the next BNS. BNS2 was released in March and features 55 new characters, 18 reimagined characters, lenticular cards, glow in the dark cards and folded cards. Unlike the All-New Series set and like the old series sets, the numbering of BNS continues where the previous series ended. They have now announced that there will be a BNS3 released in the middle of October, after the release of the Chrome edition in August. In October 2013, Topps re-released the original Series 1 as a metallic chromium set containing all 41 kids, plus 14 previously unpublished kids. On July 30, 2014, Topps re-released 1985's original Series 2 set, plus 13 returning characters from Series 2 characters that have been reimagined in previous Garbage Pail Kids sets as metallic chromium cards. Chrome cards are thicker than the original cards and are not stickers. Topps released a series of all-new cards with brand-new artwork for 2014. Like the older cards, these have activities on the back of the cards, including checklists, puzzles and Fakebook profiles. In July 2015, Topps released the 30th Anniversary Series with 110 a/b cards (220 cards total). The numbering differed from previous series in that, instead of ranging from #1–110a/b, it had several themed subsets, each of which started at #1 a/b with the subsets being checklist cards featuring variations of Adam Bomb #1–2a/b, including Adam Bomb: Don't Push My Button, featuring classic GPK characters pressing Adam Bomb's button #1–10a/b, Artistic Impression, featuring historical art as GPK characters #1–10a/b, Artistic Interpretation, featuring characters drawn by guest artists #1–5a/b, Comic Book Covers, featuring art from the comic books #1–7a/b, Cutting Room Floor, featuring rejected concepts #1–5a/b, Garbage Pail Kids' Kids, featuring the children of classic GPK characters #1–10a/b, Garbage Pail Pets, featuring animals as Garbage Pail Kids #1–10a/b, Garbage Pail Presidents, featuring 10 former U.S. Presidents as Garbage Pail Kids #1–10a/b, Lost Original Art, featuring the original paintings of classic GPKs which were never before published #1–6a/b, Zoom Out, featuring zoomed-out GPKs showing what happened in the background #1–10a/b and '80s Spoofs, featuring spoofs of things that were popular in the 1980s #1–25a/b. After the 30th Anniversary Series, Topps began using a new formula that structured each series with an overall theme divided into subsets focusing on particular topics. In January 2016, As American as Apple Pie In Your Face! put GPKs in situations that parodied American culture. A second 2016 series followed in April called Prime Slime Trashy TV with humorous takes on popular television shows. The first series for 2017 was January's Adam-geddon, which put the Garbage Pail Kids (including some classic kids) in perilous end-times scenarios. Topps announced that the second series for 2017 will arrive in October and be called Battle of the Bands, caricaturing popular music acts and album covers. On August 21, 1987, a live-action film based on the card characters was released. Its campy production made it both a critical and commercial flop, opening poorly in 374 theaters with initial receipts of $661,512 and total gross receipts of $1,576,615, barely making back its 1,000,000 dollar budget. On Rotten Tomatoes, the film holds a 0% critic rating and 35% audience rating. The film is considered one of the worst films ever made. Topps featured advertisements for the movie on the original Series 9 and 10 box-topper poster and variant wrapper. On March 12, 2012, it was announced that Michael Eisner's Tornante Company would be producing a new movie based on the Garbage Pail Kids, likely with computer-generated character imagery. Michael Vukadinovich was hired to write the screenplay for the film and PES has been hired to direct. However, the film is currently no longer in development. ^ Dery, Mark (March 19, 2006). "A Cartoonist in Despair? Now That's Funny". The New York Times. Retrieved 2010-08-07. ^ "Sticks to the Teeth, Not to the Ribs". The New York Times. August 17, 1988. Retrieved 2010-08-07. ^ Pound, Louis. "Garbage Pail Kids". Poundart. Retrieved May 21, 2012. ^ "WTF Hollywood: The Garbage Pail Kids Movie". January 22, 2012. ^ "Garbage Pail Kids Rage Stirring Up Controversy". Sun Sentinel. February 19, 1986. Retrieved 2011-07-05. ^ "Copyrights: Trouble in the Garbage Pail". Time. March 17, 1986. Retrieved 2010-03-03. ^ "Around the Nation; Judge Rules in Case Of Garbage Pail Kids". The New York Times. August 30, 1986. Retrieved 2010-08-07. ^ "Topps is bringing chrome to Garbage Pail Kids — Beckett News". Beckett.com. Retrieved 2016-03-20. ^ "Garbage Pail Kids Chrome Original Series 2 out this summer - Beckett News". Beckett.com. 2014-02-20. Retrieved 2016-03-20. ^ "The Garbage Pail Kids Return to the Big Screen". ComingSoon.net. March 12, 2012. Retrieved 2012-03-12. ^ Fleming, Mike. "Michael Eisner's Tornante Company Behind Feature Adaptation Of 'Garbage Pail Kids'". Deadline.com. Retrieved 2013-12-19.